"I want to sparsh everyone's heart." 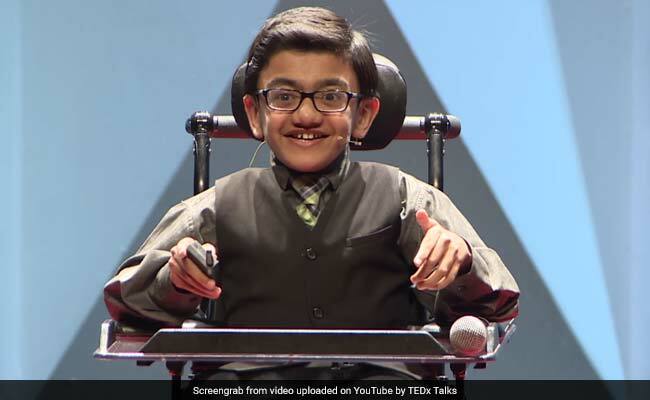 Sparsh Shah's TED Talk has collected over 2 lakh views since it was shared on May 23. Many of you may remember Sparsh Shah as the 12-year-old musical genius whose cover of Eminem's 'Not Afraid' earned him many fans. A year on, the child prodigy's popularity shows no signs of declining. In fact, going by his latest TED Talk, it has only increased. In his talk, Sparsh, now 13, talks about the challenges of living with Osteogenesis Imperfecta, a condition which makes his bones extremely brittle, his love for music, and how he turned the word 'impossible' into 'I'm possible' in four simple steps. Having accomplished as much as he has even as he is bound to a wheelchair, Sparsh's story is inspiring by all accounts. In his 14-minute-33-seconds-long TED Talk, the teen from New Jersey touches upon everything from overcoming the challenges of disability to helping others. He also winds up the talk with a wonderful musical performance. The talk took place in December 2016 in Mumbai. Beautiful, right? Many on social media agree with that sentiment. "I'm 23 and I have the same disease. I'm studying in economics. This boy is inspiration, truly," writes a commenter on YouTube. "There is one thing about this video that bothers me. The cameras did not show those of US in the front 3 rows having the time of our lives when Sparsh sang this. Whoop whoop! I was bawling. It was AMAZING!! I'll never forget it. Thx Sparsh. And thx to the Shah family. Simply amazing and we, the audience, could not have asked for a better close to TEDx Gateway 2016!!!! Life changing!" writes a commenter who was presumably in the audience.